Our fabulous Shower Shave & Shampoo soap bar using a luxury mix of oils and butters. We start with pure virgin olive oil and add a generous amount of coconut oil as the base for this Soap. Add 15% castor oil to give the bar its amazing lather along with 5% shea butter and 5% cocoa butter for their wonderful soap qualities. You can’t make a soap bar without adding water and sodium hydroxide (NaOH). We add just enough NaOH to keep 5% of the oils and butters suspended as oil in the bar. We test the PH just to make sure it is below a PH of 8 to ensure no sodium hydroxide is left in the bar after it has cured. For color and slip we have added a small amount of Brazilian yellow clay, pink clay, and kaolin clay. The green in this bar is derived from adding food grade spirulina (green algae) . For the red we have pink clay and powdered rose hip. The not so secret ingredient for our scrub bar to give it some grit is to add some fresh ground decafinated columbian coffee beens. These are ground fairly fine and give the bar its browns and blacks. 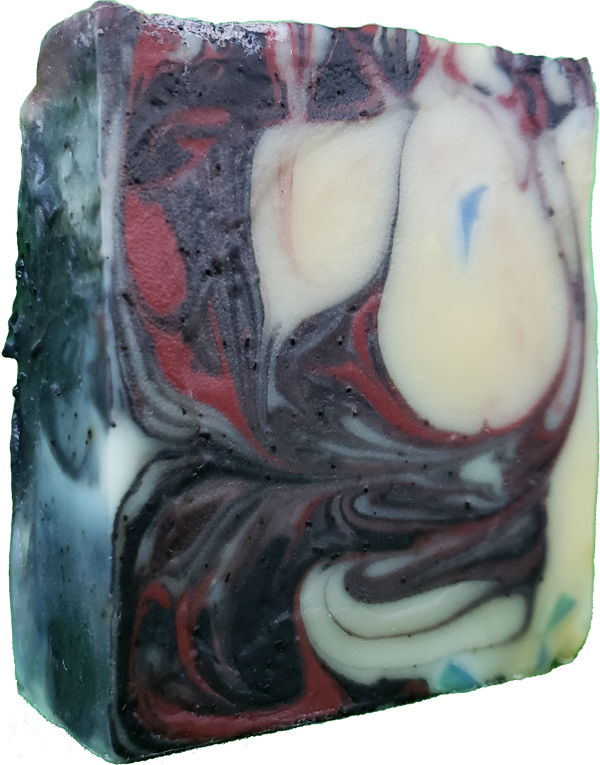 To top the bar off we add a mix of Tea Tree and Lemon Grass essential oils and finally a pinch of raw silk dissolved into the bar to smooth things out. The silk we use comes from hatched cocoons so no silkworms were harmed while procuring the silk.